The Society’s annual Book Prize has gone to a former National Theatre Stage Manager for her account of the exceptional circumstances in which the National Theatre mounted a production of Fernando Arrabal’s The Architect and the Emperor of Assyria at the Old Vic. The award was presented by Sir Richard Eyre in the Grand Saloon at the Theatre Royal, Drury Lane, after the audience of theatre people, publishers, writers and academics, along with the Society’s own members had heard this year’s judges describe some of the highlights among the more than seventy books that were entered for our prize for books published in 2016. Sir Laurence Olivier, then running the National, had some concerns about this production which was directed by Argentinian Victor Garcia, an enfant terrible highly thought of by NT Associate Kenneth Tynan. He asked stage manager Jackie Harvey to keep a detailed diary of rehearsals – which now forms the core of this book. 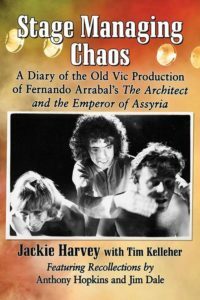 Stage Managing Chaos, which Jackie Harvey wrote with the collaboration of Tim Kelleher, gives a wonderful insight into what the job is really like and, for the reader at least, it is very, very funny as star Anthony Hopkins is nearly driven to breakdown. Sir Richard, who remembered seeing it, certainly thought it a disaster. He suggested that the making of this now published record was Olivier’s way of dissociating himself from it. The judges: Aleks Sierz, Cathy Haill of the Theatre Collections at the Victoria and Albert Museum and actress Nichola McAuliffe (chaired by committee member Howard Loxton for the Society) made lively presentations about some of the highlights among the 78 books that were entered this year.